The Arrest of Christ, unknown artist, ca. 1520. Peter attacks Malchus (Caiphas' slave) in the Garden of Gethsemane. 405 people in our community are currently praying with you. The first verse of this piece is a stylistic throwback to 1910. Does anyone else (especially among our older readers) hear The Sweetheart of Sigma Chi in the first line? There's hope in saving grace. Than gold or silver ever could afford . And covers all the world. It's power is eternal, eternal. It's glory is supernal, supernal. There'll always be the love of God. That sin could ever leave. Who will on Christ believe, will believe. His power is eternal, eternal. His glory is supernal, supernal. When all this earth shall pass away. Most blessed Christ, I thank you that you have answered me and have become my salvation. No matter how weak or lowly I may feel, I will always remember your words: that those whom the earth despises — the stones that the builders rejected — have become the cornerstone of your church. Let me be strong in faith and strong in your Spirit; for only by You, Lord Christ, may the gates of righteousness be opened to a sinner. I pray that I may be part of the foundation of your church on earth, and that by your grace, the gates of righteousness may be opened to me and to all who confess your holy name. 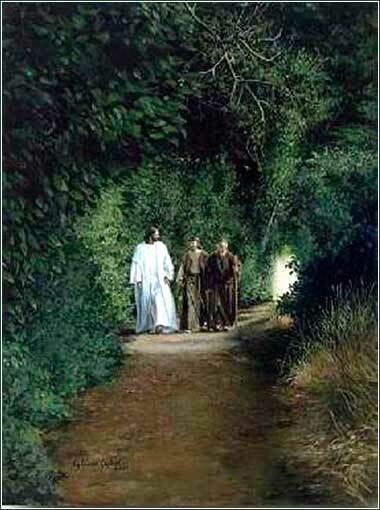 The Road to Emmaus by Liz Lemon Swindle, contemporary. From that timeThat is, from the time when Peter first recognized Jesus as Christ, the Son of God, in Matthew 16:15-17. Jesus began to show his disciples that he must go to Jerusalem and suffer many things from the elders and chief priests and scribes, and be killed, and on the third day be raised. In the preceding verse, Jesus told his disciples not to tell people He was the Messiah, and today's Scripture shows why. Peter is the greatest and holiest of the apostles, and yet, his reaction shows how far he is from understanding Christ's teachings. Jesus has taught them many things, and specifically, the difficult lesson of Matthew 5:38-48. It is this teaching — not to resist evil people — which Christ intends to put into action, to demonstrate with his life what He has said with his words. “Elders and chief priests and scribes” describe members of the Sanhedrin, the theocratic governing body of the Hebrews. The chief priests were the head men, and the position was firmly in the hands of Sadducees. A man named Annas, who could have given lessons to Machiavelli, held the reins of power over the office; the five chief priests following him were all his family. (Caiaphas, the chief priest who will rule over Jesus' trial, was Annas' son-in-law.) Scribes sat by virtue of their learning and wisdom; elders by their general reputation. When Peter first hears that Jesus will allow these people to kill him, Peter catches hold of him. It is an instinctive protective move, for Peter loves him, and the idea of Jesus being killed horrifies him. The ultimate temptation of the flesh is self-preservation. So when Peter shows a protective instinct, Christ (and Matthew) remind us that Christ has faced temptation of the flesh and resisted it fully. Peter is not what we would call an evil man; he is only human, reacting with the human instinct for survival. But he has not fully digested the Sermon on the Mount. The words are clear, but hard to incorporate in one's mind, much less in one's actions; for the temptation of self-defense is powerful. So when Jesus repeats the words “get behind me, Satan,” (Matthew 4:8-11), He is not saying Peter is Satan incarnate; rather, that Peter has not resisted the temptation that Jesus has faced and overcome. And in fact, the lesson is so difficult that Peter will not incorporate it until long after Christ's death, as will be seen several times in the Garden of Gethsemane. So while we would not call Peter “evil”, he is unwittingly arguing Satan's position. He urges Christ to hypocrisy. It is the voice that we all hear, telling us to compromise our faith with the world. The life of Peter, and his relationship with Jesus, holds a great lesson for every Christian, because Peter is usPeter is a lot closer to Christ, in fact, than any other human being in history. We will never attain his degree of holiness. But at this point in time, he is going through a period of growth and acceptance that we all face.. Every one of us ignores or rationalizes away the more difficult teachings of Christianity. The pull of the flesh is intransigent. Even a man as holy as Peter will undergo tremendous strain before he overcomes it, and it will not occur until the Pentecost.